From the Maritimes to Vancouver, BC, Dal AC student Patrick Belliveau travelled from coast to coast for an experience like no other. 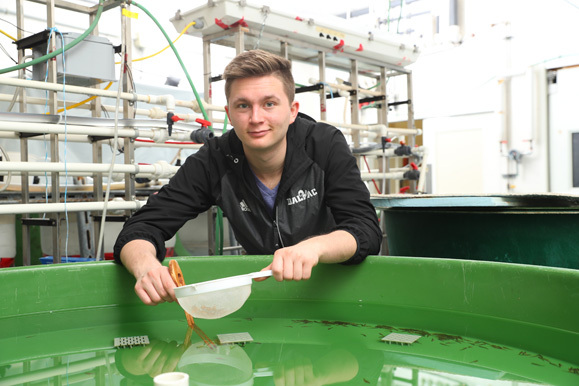 Patrick, majoring in aquaculture, moved west to Vancouver Island last summer to gain hands on work experience by working on a west coast fish farm. Located in British Colombia, Cermaq Canada is the second largest producer of Atlantic salmon in Canada. Cermaq Canada is a branch of the international salmon farming organization Cermaq, which has operations in Canada, Chile, and Norway. Cermaq Canada farms Atlantic salmon on 28 sea sites on both the west and east coasts of Vancouver Island. They also operate four land-based hatcheries and two processing plants. Cermaq Canada operates on salt water cage sites that are typically anywhere from a 20 minutes to a three hour boat ride away from the nearest town. The site that Patrick worked from was about an hour boat ride from the town of Tofino. Working with a team for ten hours each day eight days straight at a time, Patrick became close with the team that he worked with; something that was necessary for their success. A typical day for the team started with early morning water quality checks. Patrick explains that the rearing water is checked for oxygen, temperature, and any phytoplankton (microscopic organisms) that may be harmful to fish. Once the checks are complete, the feeding begins. Atlantic salmon are fed pellets which are blown into each cage. In addition to daily duties, Patrick explains that monthly practices include safety checks, weight and length samples, sea lice counts, cleaning cameras, changing lights, and maintaining air diffusers. Patrick will be returning to Cermaq Canada this summer as a full fish health technician. He is thrilled to be returning and to have so many different opportunities at his fingertips through his aquaculture studies. He explains that he first became interested in aquaculture through a friend. Originally from Sussex, New Brunswick, Patrick chose to study at Dal AC for the hands-on learning opportunities and the level of technology that students have full access to. The hands-on learning experience has proven to be his favorite thing about studying at Dal AC. In his spare time, Patrick plays soccer on the men’s varsity soccer team and plays ultimate Frisbee with a club. He explains that he enjoys trying new things, and has played in the rugby 7’s tournament in previous years. As Patrick wraps up his studies and prepares to graduate this spring, he plans to go back to Cermaq Canada to work. While he has no defined plans for the future, Patrick would like to continue his education at some point. As for his choice to study aquaculture, Patrick has no regrets. His journey has led him to the other side of the country and back again and he’s learned a lot along the way. He looks forward to what’s in store for him and encourages other students to explore aquaculture and the opportunities it can offer.